Find Local Printing Service across California. Printing Service California. Next day or same day printing company in Los Angeles, California. Located in Los Angeles, CA. Offers Screen Printing, Digital Printing, Litho Printing, Finishing, Warehousing & Fulfillment, G7 Master Certification, POP, Signage and Displays, Design, Large Format, Structural Engineering, Fleet Graphics, C.A.D. Wraps. Zoo Printing is a wholesale print company with nationwide locations (CA, KY, NJ). Design Online available for 20+ products. Offers largest selection of offset and digital products on the market, also features large format, 4-Color Offset Printing, 1 & 2 color printing, 4-Color Digital Printing, Roll Labels and custom estimates for any job. Located in the heart of Hollywood, Bunker L.A. is a premiere headshot and model card printer for the fashion and entertainment industries. Product are Head shots, Comp Cards, Model Cards, Zed cards, Portfolio Prints, Look Books, Flip Cards, Photo Retouching, Layout Design, Business Cards, Photo Post Cards. Custom Print Jobs, Green Certified, Traditional and Digital Print Presses. Serving LA since 1984. Offers Multi-Color Offset Printing, Digital Printing, Custom Printing, Large Format Printing, Finishing & Bindery, Graphic Design and Typesetting etc. Graphic design and printing company based in Los Angeles. Offers Business Cards, Flyers, Banners, Window Decals, Booklets, Presentation folders and more. Affordable cheap price high quality printing since 1984. Offering custom digital printing, offset printing, same day printing, mailing, bindery services, design services (posters, banners, canvas, backlit film and retractable banner stands), wide format – large format printing etc. Serving Areas : Los Angeles, Hollywood, Culver City, West LA, Palms, Westchester, Santa Monica, Beverly Hills, Century City, and all surrounding areas. Saturday and Sunday : Closed. Printing Company in Los Angeles, California. Same day and next day business card printing services in Los Angeles area. Full color custom envelope printing services in Los Angeles. Full color printing, signs & vinyl banners, stationery printing, business card printing, packing & shipping services in Los Angeles, California. 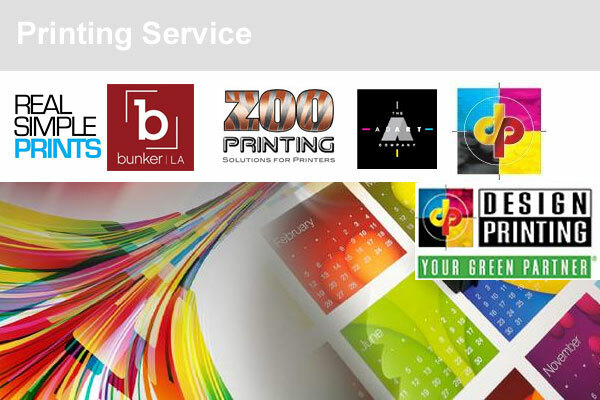 Eco-Friendly printing company in Downtown Los Angeles offering same day delivery. Offers large format printing, digital printing, booklet printing, brochures printing, flyer printing and postcard printing etc. custom business cards (foil stamp, emboss, spot UV), Event Flyers, Catalog and Booklet Printing, Banners (Small and Large) etc. Specializes in the production of printed materials for professional filmmakers, producers, executives, actors and models. Sat : 11am – 6pm, Sun : closed. Fine art printing and photo printing Los Angeles. Services are scanning (flat bed scanning, large format flatbed scanning), digital capture, aluminum prints, canvas printing, fabric printing etc. Hours : Mon-Fri (8am-6pm), Sat and Sun Closed. 3d printing service in Los Angeles : Hollywood 3D Printing, 3D Hubs Los Angeles, LA3-D, Solid Image 3D, Deezmaker 3D Printers, Christy Designs, Guru Printers, Kapow! 3D, The Build Shop.